Heading to Austria’s capital but don’t know what to do, see and eat? Take a waltz around Europe’s ‘city of dreams’ to help you on your hols. Beautiful boulevard Ringstrasse is home to many of Vienna’s most notable landmarks, including the Vienna State Opera and the Museum of Fine Arts. Hop on and off the tram along its route or hire a bike and take in the magnificent views. Known as The Wiener Staatsoper in the local lingo, this is one of the busiest opera houses in the world. With around 55 opera and 10 ballet productions in a year, you’re spoiled for choice when it comes to choosing what to watch in this beautiful building. 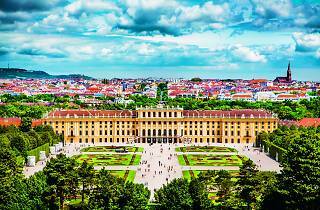 Originally opened in 1891, this palatial museum is the largest in Austria. Lay your eyes on works such as Rembrandt’s Self Portrait and Jan van Eyck’s Portrait of Cardinal Niccolò Albergati. There’s Egyptian and Near Eastern collection, as well as a collection of Greek and Roman antiquities if art isn’t your thing. Take a ride on the 19th century Riesenrad giant ferris wheel. A full circle takes a gentle 20 minutes and its highest point is 65m. When you’ve come back down to Earth, visit the Sigmund Freud Museum, set in the apartment where the founder of psychoanalysis lived and worked from 1898 until 1938, when he was forced into exile by the Nazis. No trip to Vienna is complete without a visit to Schönbrunn Palace. The baroque feat of architecture is bursting with history and features lush gardens with a stunning gloriette structure and Tiergarten Schönbrunn, which claims to be the oldest zoo in the world. Würstelstand (sausage stands) are 10 a penny in Vienna but one of the best is the Würstelstand am Hohen Markt. If you’re feeling green and clean, trendy deli and record store Tongues uses unsold organic produce to cook up wallet-friendly and wholesome lunches. Vienna is a city of bureaucrats and students and inside the city’s ministries and cultural institutions are canteens serving subsidised grub that allow a glimpse into the underbelly of the Austrian state – art school canteen Akademie der Bildenden Künste boasts a magnificent interior and large beers. For fine fusion food, head to Californian-style Japanese joint Mochi for Japanese cuisine with modern flair. Tuck into into dishes such as sushi rolls, gyoza soup and gyu tataki. Fancy a cheeky tipple? Head to Rochus, a light and bright café bar for classic and classic or creative cocktails. If you need something to soak it all up, there's a hefty menu of hearty offerings, too. Coffee culture is prevalent in Vienna, so make sure you head to a coffee house such as Julius Meinl, which has been serving stellar brews since 1862. The exquisite Hotel Bristol one of the oldest luxury hotels in Vienna at 125 years old. The interior features stunning marble, grandiose columns, oak walls, gilded mirrors and sparkling crystal chandeliers that have been retained since its 1882 opening. Toiletries here are courtesy of Bvlgari, so even showering is a treat. Located in Vienna, this traditional-style hotel has the ideal location opposite the State Opera and next to the Kärntner Straße. The Karlsplatz Transportation Hub that connects to most parts of Vienna is just a few steps away, too.